UBC interdisciplinary performance students Shane Zhu, Patti Leinemann and Cari Craig pay homage to car culture in the original stage montage Roundabout. When: Thursday, April 10, Friday, April 11, and Saturday, April 12, 8 p.m.
UBC performance students are staging a rousing year-ender with a montage that pays homage to our eternal fascination with the automobile. Or in this case, the West’s favourite steed of the highway, the venerable pickup truck. 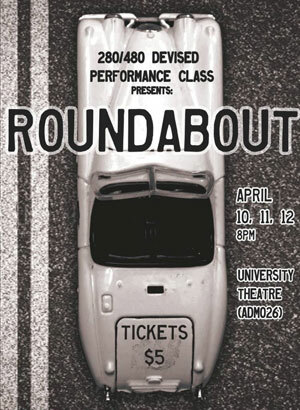 Created and performed by bachelor of fine arts students in the interdisciplinary performance program in the Department of Creative Studies, Roundabout is a story of the joy and disappointment surrounding car culture. Under the direction of Associate Professor Neil Cadger, the story starts in Kelowna with a young man named Kyle. He is desperate, unable to make payments on the beautiful, black Ford 150 truck he bought in Edmonton. The stash of cash he saved from a year’s labour in the oil sands is gone and there’s no work in sight. What is Kyle prepared to do to keep the truck? Roundabout uses this simple story to explore how we see and don’t see cars – and how our culture is molded by their seductive promises. The performance features a live band, choral singing, evocative imagery and experimental video and sound components. 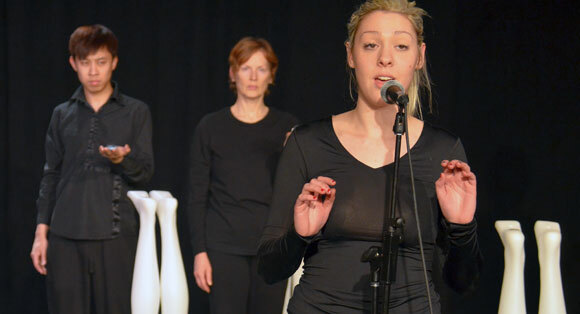 Roundabout is being performed Thursday, April 10, Friday, April 11, and Saturday, April 12, 8 p.m. at University Theatre, (ADM026), at UBC’s Okanagan campus. Admission is $5 at the door.